I've never thought the eyes were the window to the soul so much as the desk is. 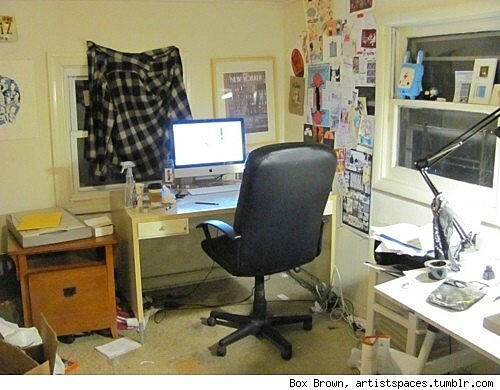 After all, the way a person treats their workspace says a lot about them. Do they work in a cheerful, brightly lit space filled with plants and knick-knacks? Or have they carved out chaotic office spaces amid collapsing towers of paper? 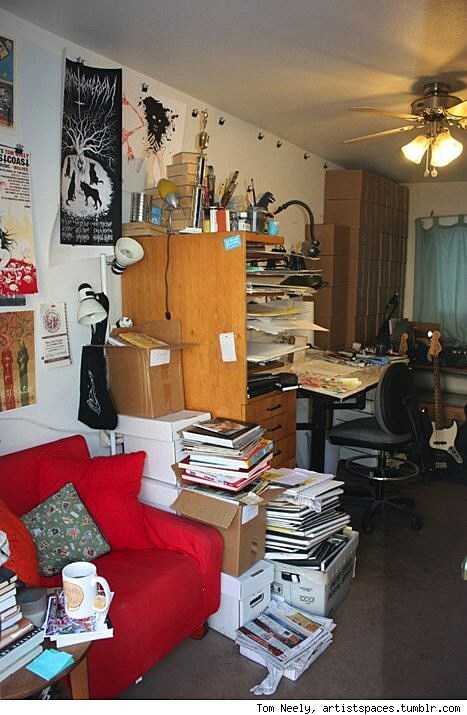 The Tumblr blog Where They Draw offers glimpses inside the offices (and perhaps the souls) of cartoonists. Comic essayist Lucy Knisley, whose desk appears up top, takes the prize for "Cartoonist I'd most like to decorate my house." She just moved back to New York from Chicago, and already her apartment looks like a home. Knisley surrounds herself with all of her favorite things, and her fireplace is filled with videogames. Plus, although you can just barely see one in this picture, there are skulls lurking all over the joint. 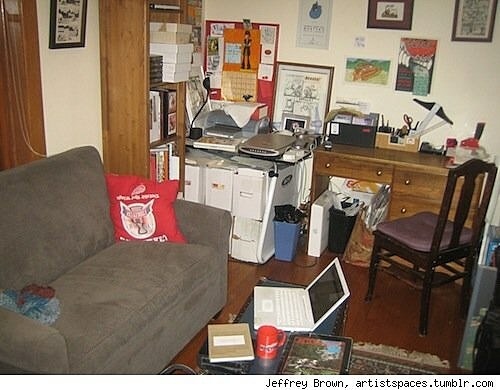 Jeffrey Brown's unpretentious comics -- like Clumsy, Sulk and Incredible Change-Bots -- would have to come from an unpretentious workspace. Still, I'm not sure I could work in an office with so little color. Tom Neely, creator of The Wolf and The Blot, works out of his garage office, which has all the markings of controlled chaos. One wrong move, though, and that Jenga tower of books will all come crashing down. Where is pornographic gentleman robot Chester 5000 XYV born? 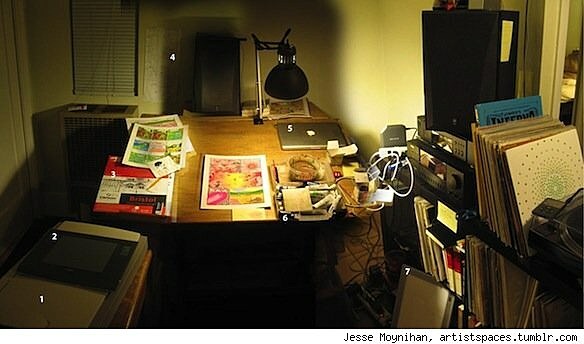 In Jess Fink's brightly lit, multi-use office. 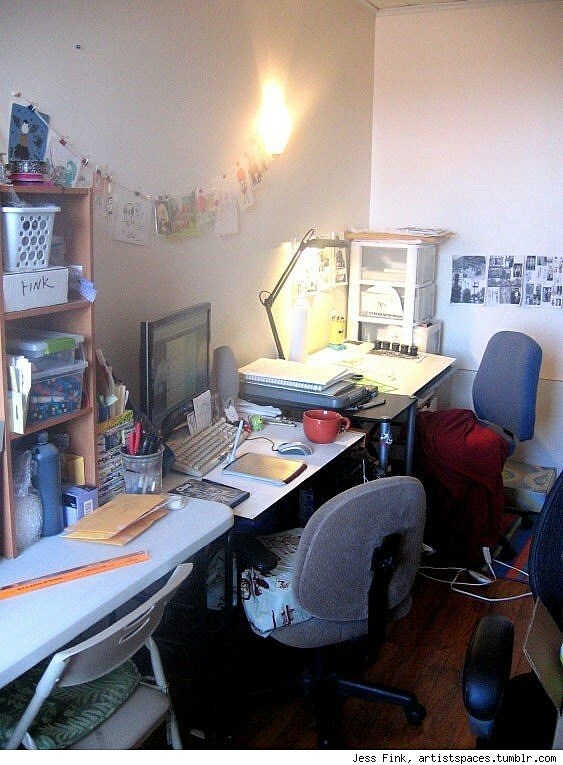 Each desk has its own purpose: the first for making jewelry, the second for computer work and the third for drawing. Appropriately, everything has its place -- even that cuddly looking blanket on her drawing chair. 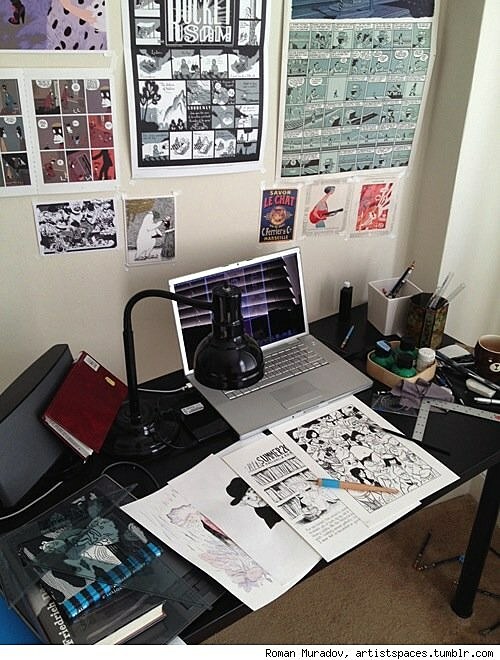 Jesse Moynihan (NSFW) creates the surreal webcomic Forming, as well as storyboards for the always fantastic Adventure Time, but his home workspace is strangely dark. Perhaps that makes it look like the light is emanating from the awesomeness of his artwork. 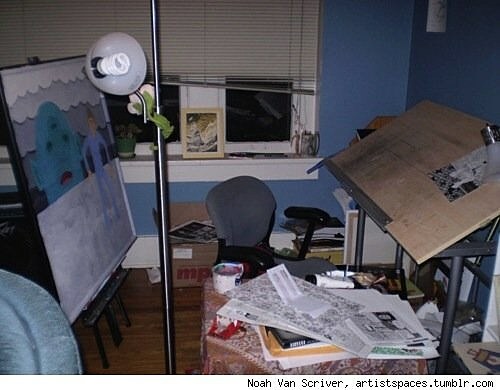 Blammo cartoonist Noah Van Sciver works amidst the mess -- although he swears he knows where everything belongs. The real question is how he gets any work done with that painting looming over his shoulder. Box Brown draws Everything Dies and runs Retrofit Comics from his office, where more things seem to end up on the floor than on the desk. I can't help but wonder what's so horrible about the view that he'd rather stare at a plaid shirt all day. I'm surprised how little color we get in these office spaces, so it's a relief to see Eamon Espey's red, red room. Also, this is a man who doesn't fear the ink splatter. 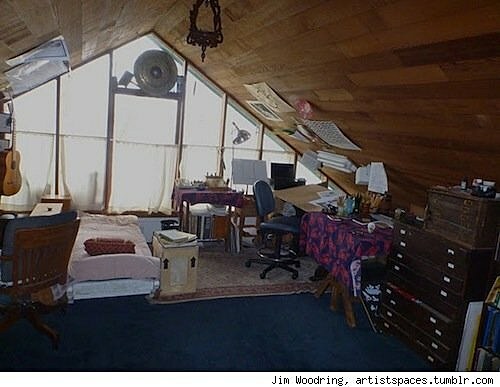 Frank artist Jim Woodring has a workspace I'd love to curl up and live inside. It's cheerful, airy and has the perfect spot for napping. Roman Muradov makes Sad Comics, and is fond of assuring the world how terrible he is, but his inner adorable soul is betrayed by the bear coffee mug on his desk. 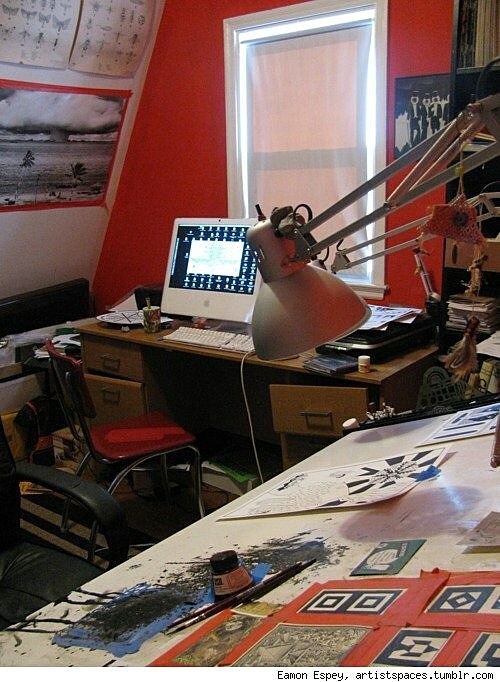 Be sure to check out Where They Draw to see more cartoonists' workspaces, and see the artists describe them in their own words.